Fire things up on the BBQ with a tangy taste from the east. ADD soya and ground ginger to barbecue sauce. MARINATE chicken pieces with half of the sauce. 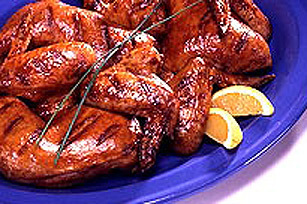 BARBECUE chicken pieces, brushing with remaining sauce. Serve with the rice.